A new year of ministry is nearly here, which means you’ll regularly face this question from parents, volunteers, friends, or perhaps your supervisor: How did youth group (or retreat, or lock-in, or special event) go yesterday? What you say in response likely reveals a lot about you and how you measure success in ministry. When I was a youth pastor, I certainly fell into measuring the success of our ministry by the number of people attending. In my work with youth and young adult leaders today, my experience is that too few have a well-thought-out approach for assessing whether or not their ministry is effective. Based on the Fuller Youth Institute’s Sticky Faith and Growing Young research with hundreds of congregations, we’re convinced that our ministries need a better scorecard. More than that, we think developing new measures is actually possible and has the power to breathe life and vitality into our churches. In sports, success or winning is clear-cut, as there’s a way to keep score. In business, money can often be the clear indicator of success. But ministry? Not quite so clear. Let’s go back to the question, how did youth group go last night? In an ideal world, we’d know if our efforts contributed to young people trusting and following Jesus wholeheartedly...for the rest of their life. Unfortunately, there’s no way to know for sure until years (or decades) down the road. However, this doesn’t mean we’re off the hook. In fact, if we truly care about the young people entrusted to us, we can’t let ourselves off the hook. Especially when some of the best research on the church and young people today indicates that our ministries are falling short in passing on the faith to the next generation. This warrants serious consideration about the meaning of success and the measures that indicate we’re on the right track. If you’re ready to develop more helpful metrics for your ministry, you’ll likely find business leadership guru Jim Collins a helpful guide. In his insightful monograph Good to Great and the Social Sectors, he translates his research from the business world to organizations like churches and schools. A key insight from Collins for ministry leaders is that defining clear metrics is more about assembling evidence than quantifiable facts. In ministry, we will never be able to exhaustively explain the ministry of the Holy Spirit – and the good news is that, according to Collins, we don’t have to. How many intergenerational relationships were formed through this ministry or event? When and how did we give young people the opportunities to take on the keys of leadership? On a scale of 1-10, how well are we as leaders modeling a life of trusting and following Jesus as we interact with young people? How many parents did I have a conversation with before or after the gathering? While indicators like total attendance can be helpful in some ways, consider how consistently tracking questions like the four above might shift the way you plan and structure your ministry gatherings. Perhaps create your own list of alternative measures that serve as evidence you’re headed in the right direction. Our team at the Fuller Youth Institute has taken Jim Collins’ advice to assemble evidence of effective, long-term ministry to heart. We’ve spent the last four years conducting research on churches with innovative, thriving ministries to teenagers and young adults and have developed the Growing Young Assessment - an academically-validated survey tool that can provide vital insights about your church’s effectiveness with young people. We as ministry leaders need to rethink success and define new measures. Let’s push beyond mere numerical attendance and dig into more complex questions of engagement, impact, and faithfulness to our calling. 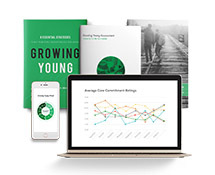 Discover the power of the Growing Young Assessment!